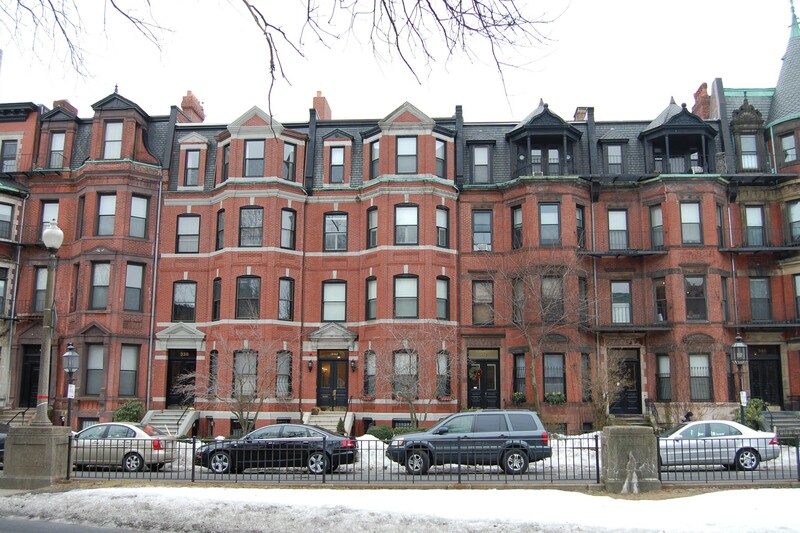 336 Commonwealth is located on the south side of Commonwealth, between Hereford and Massachusetts Avenue, with 334 Commonwealth to the east and 338 Commonwealth to the west. 336 Commonwealth was designed by architect George A. Avery and built in 1881 by Vinal & Dodge, masons, for speculative sale. Vinal & Dodge are shown as the owners on the original building permit application, dated February 9, 1881. The house was originally numbered 334 Commonwealth until about 1889, when 328 Commonwealth was built and the houses to the west of it were renumbered. 336 Commonwealth was one of thirteen houses (336-360 Commonwealth) built for George Wheatland, Jr., by Warren D. Vinal and Charles A. Dodge on land owned by Charles Merriam and by Jacob Rogers. 336 Commonwealth was designed by George Avery, 338-340 Commonwealth were designed by Bradlee, Winslow, and Wetherell, and 342-360 Commonwealth were designed by Obed F. Smith. 336-338 Commonwealth were built first, in 1881-1883, on Charles Merriam’s land. On December 10, 1881, after 336 Commonwealth was completed, Charles Merriam sold George Wheatland, Jr., the house and land, together with the remainder of his land to the west. On the same day, George Wheatland, Jr., sold 336 Commonwealth and the 24 foot lot at 338 Commonwealth to Warren Vinal and Charles Dodge. He retained the two feet the west. Click here for an index to the deeds for 336 Commonwealth, and click here for further information on the land on the south side of Commonwealth between Hereford and Massachusetts Avenue. On June 6, 1882, 336 Commonwealth was purchased from Warren Vinal and Charles Dodge by Caroline (Osborn) Warren, the wife of Frederick Warren. At the time of their purchase, they were living in New York City, but had made 336 Commonwealth their home by the 1883-1884 winter season. Frederick Warren was associated with his family’s shipping firm, Warren & Company, operators of steamships between Liverpool and Boston. On May 8, 1896, Caroline Warren transferred the property into her husband’s name. Frederick Warren died in May of 1900. 336 Commonwealth continued to be owned by a trust established under his will for the benefit of his widow. Caroline Warren continued to live at 336 Commonwealth until her death in July of 1910. In 1910, her nephew, Frederick Osborn, lived with her. He was a civil engineer. On November 23, 1910, 336 Commonwealth was acquired from Frederick Warren’s estate by Lillior (Lillie) Taylor (Dowling) Nutting, the widow of William B. Nutting. She was the sister of Mark Temple Dowling, a real estate dealer in partnership with James Sumner Draper. On December 14, 1910, 336 Commonwealth was acquired from her by J. Sumner Draper. The house was not listed in the 1911-1914 Blue Books. On March 25, 1914, J. Sumner Draper transferred the property back to Lillior Nutting. On October 6, 1914, 336 Commonwealth was purchased from Lillior Nutting by Charlotte Elizabeth (Houston) Fairchild, the wife of John Cummings Fairchild. They previously had lived in Dedham. John Fairchild was a stockbroker. Charlotte Fairchild was a professional photographer with studios at 384 Boylston. They separated in 1915. He moved to 46 Gloucester, and she moved to New York City, where she became well-known for her photographs of actors, dancers, and members of New York Society. During the 1916-1917 winter season, 336 Commonwealth was the Alpha Tau Omega fraternity house. In 1916, it had been located at 30 Newbury. It subsequently moved to 37 Bay State Road. On February 8, 1918, J. Sumner Draper’s first cousin, Joseph Porter Draper, foreclosed on a mortgage he held on 336 Commonwealth and took possession of the property. The property was not listed in the 1918-1920 Blue Books. On April 14, 1920, 336 Commonwealth was purchased from Joseph Draper by Clara Agatha (McNamee) Bradshaw, the wife of stockbroker James Edwin Bradshaw. They previously had lived in Winchester. 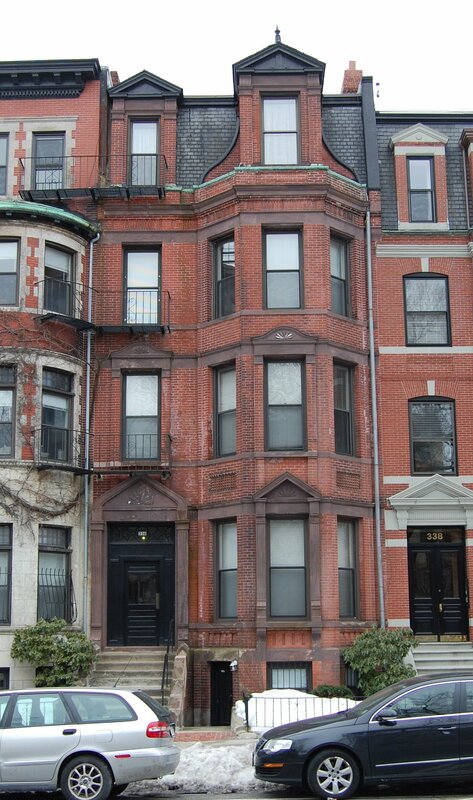 The Bradshaws continued to live at 336 Commonwealth in 1923, but had moved to Brookline by 1924. On June 29, 1923, 336 Commonwealth was purchased from the Bradshaws by Dr. William H. Regan. He was a physician and eye, ear, and throat specialist, and converted the property into a combination of medical offices and lodgings. He and several other physicians maintained his offices there. A bachelor, he lived in Cambridge and also maintained lodgings at 336 Commonwealth. On July 2, 1923, he transferred the property to his sister, Annie E. Regan. William Regan died in March of 1928. In April of 1928, John E. Regan (William Regan’s brother) et al applied for (and subsequently received) permission to install a fire escape. The intended occupancy of the property was shown as being a lodging house. By 1929, 336 Commonwealth was the home of Mrs. Flora Harriet (Sharp) Lowe, the former wife of Edward Stephen Lowe, who operated it as a lodging house. She had lived at 378 Marlborough in 1928. She continued to live at 336 Commonwealth in 1930. The property was not listed in the 1931 List of Residents and was shown as vacant in the 1931 and 1932 City Directories. By 1933, 336 Commonwealth was the home of William J. Lowery and his wife, Agnes J. (Johnston) Lowery, who operated it as a lodging house. They previously had lived at 596 Tremont. They continued to live at 336 Commonwealth in 1935, but had moved to 200 Commonwealth by 1936. By 1936, 336 Commonwealth was the home of George Emules LeTendre and his wife, Rose (Sylva) LeTendre. They previously had lived at 57 Hemenway. They operated 336 Commonwealth as a lodging house. They also operated lodging houses 395 Marlborough from about 1941 to 1946, at 364 Marlborough in about 1942 and 1943, at 338 Marlborough in 1943 and 1944, and at 365 Marlborough from 1943 through 1946. On June 30, 1937, the Massachusetts Hospital Life Insurance Company foreclosed on a mortgage it held on 336 Commonwealth and sold the property to real estate dealer Henry C. Brookings. On March 1, 1938, it was acquired from him by George and Rose LeTendre. The LeTendres lived at 336 Commonwealth until about 1943, when they moved to 338 Marlborough. They continued to own 336 Commonwealth and operate it as a lodging house. On March 29, 1946, 336 Commonwealth was acquired from the LeTendres by Leonard Francis Martin, an electrician, and his wife, Juliette Sadie (Boutiette) Martin, who operated it as a lodging house. They previously had lived in Somerville. 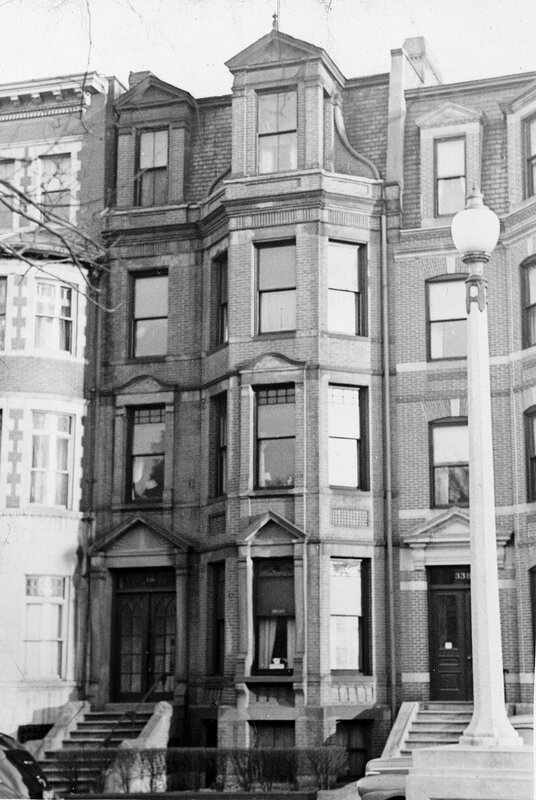 They continued to live at 336 Commonwealth until about 1950. On December 20, 1950, 336 Commonwealth was acquired from the Martins by Albert Zimmerman. He also owned 344 Commonwealth. On March 30, 1951, he transferred both properties to the Zimmerman Realty Corporation. In June of 1951, he applied for (and subsequently received) permission to convert 336 Commonwealth from a lodging house into ten apartments. 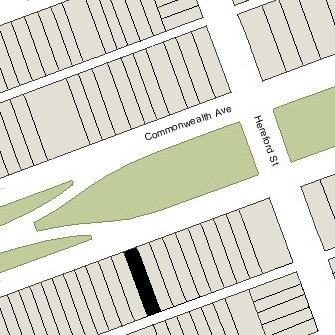 On May 4, 1967, Robert White acquired 336 Commonwealth and Jack Aifer’s other four houses on the block. He already owned 324–326 Commonwealth and 348 Commonwealth. By December of 1978, he owned 322–324–326–328–330–332–334–336 Commonwealth, 344-346-348–350 Commonwealth, and 354–356–358–360 Commonwealth. 336 Commonwealth remained an apartment house in 2018.